It's "Do Over" Thursday with My Creative Time! This is the day to take an old project you've made and give it a new look! For today's project I took a card that I made a couple of years ago (you can see it further down in this post) and redid it, keeping the layout, but changing the colors and some of the elements. Both cards are 3 1/2" x 5". For today's, my background piece is inked up with Tim Holtz Distress Inks in Chipped Sapphire, Peacock Feathers, and Mustard Seed. After blending the ink, I spritzed it with my Tim Holtz Distress Sprayer, and once it dried, I ran the piece through my Vagabond with one of the More Stitched Rectangular Dies. I trimmed off the right side to make it fit my card base, and then added a black piece for the right side, which I trimmed with the same More Stitched Rectangular Die, along with one of the More Stitched Edges Dies. 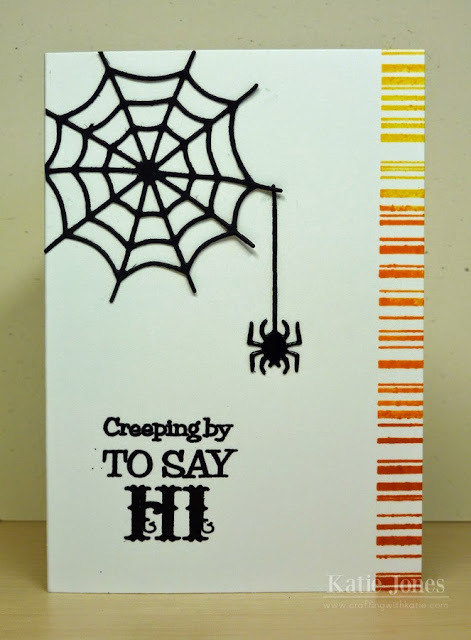 Next I added a sentiment from the Happy Haunting stamp set, a cat made with a die from Spooky Time, and a web and spider made with dies from Wicked Fun Dies. I covered the spider with Glossy Accents. Here is my original card. More details can be found here. Oh Miss Katey Love your card it's totally WICKED AWESOME!! Great job on your background...it sure makes for a Faboooooolous look. You really, REALLY did an Outstanding SPOOKTACULAR Creative job!! YOU so ROCK!! Your inked background is so pretty and beautiful. 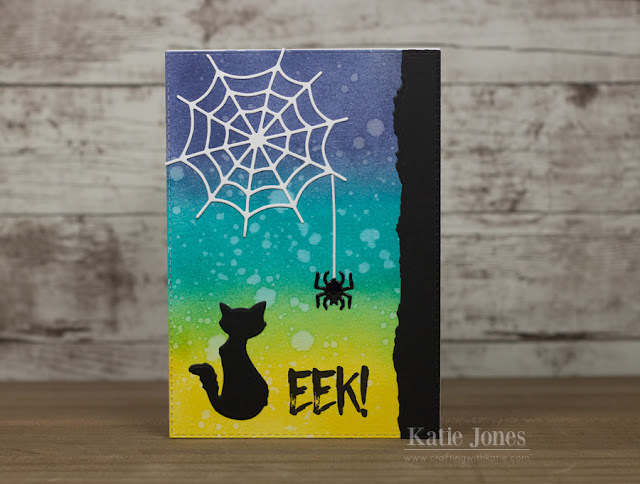 I love the cat and how you made the web white and the spider in black. The torn edge is a great touch too. Wonderful job.